Updated Information Available! In the months since I wrote this article, new camera models have come out, and others have been refreshed. I have updated the information in this article and included it in a new Guide to Low Light Performance. Don’t worry, it is free. To see how to get the new info, make sure you read all the way to the end of the article. An important feature to consider when purchasing a digital camera is how well it performs in a low-light situation. The question is: how much can you crank up the ISO setting on your camera and still have a good picture? Digital cameras allow you to set how sensitive your digital sensor is to light, and that setting is called ISO. There is no free lunch though, and the more you increase the ISO on your camera, the more digital noise–random colored artifacts–will permeate your picture. While low-light performance is more important for some photographers than others, it is something that everybody needs to worry about sooner or later. Sometimes you will find yourself hand holding your camera in low light, so you will need to increase the ISO to avoid camera shake. Sometimes you will find yourself taking photographs indoors, where there is always less light. Sometimes you will want to stop the action by using a fast shutter speed without having sufficient light to do so. It is important in each of these situations. Modern digital cameras have made great strides in improving the ability to shoot at high ISOs without introducing a ton of digital noise into the picture, but it is still something to think about. So this article will walk through how to compare low-light performance in digital cameras. How do we measure low-light performance in digital cameras? There is no uniform scale used by the manufacturers. You can look at the range of ISO values allowed by the camera, which will give you some sense of the low-light performance. But how do you know that the picture quality at a given ISO will be any good? In other words, it doesn’t matter if your camera goes to ISO 25,600 if it cannot take a quality picture at ISO 800. So how do you know how high you can reasonably go with the ISO in a given camera? And how do we compare that result to other cameras? Fortunately, a company called DxO Mark has done a lot of the work for us. They test all cameras that come on the market, and one of the tests they perform specifically measures low-light performance. They called it their “Sports” score–since photographing at high speeds in low light is very important to sports shooters–and they determine the highest usable ISO for each camera they test. DxO Mark gives their results as a specific ISO level. A camera with a score of 926 means that the highest usable ISO for that camera is 926. I have no idea how they get this specific level since most cameras are only capable of adjusting ISO at 1/3 stop increments. But they do, and we’ll just take their word for it for now. There is an issue with DxO Mark testing that I need to mention up front. For some reason, DxO Mark hates Canon cameras. No, I actually don’t think the people at DxO Mark really hate Canon, but their testing results for virtually all Canon cameras come in obscenely low. For example, DxO Mark rates all cameras on the market based on their test results, and they do not have one Canon camera in their top 30 cameras. Not one! DxO Mark actually has compact cameras and discontinued models from other manufacturers rated higher than Canon professional level DSLRs. As a result, some have questioned the reliability of DxO Mark. I don’t think DxO Mark is out to get Canon (and frankly, if they were, they wouldn’t be so obvious about it). I have never seen anything specific that indicates an inherent problem with DxO Mark testing. But there is something about their testing that causes Canon scores to skew very low. I’m sure DxO Mark would say Canon just isn’t making cameras that measure up, and while they are sorry if that offends some people that love Canon cameras, that is just the way it is. I have no information one way or the other on this issue. Therefore, I choose to side-step it. In the results below, I’m just going to put all the cameras in two different buckets. We’ll compare all the non-Canon cameras in one bucket, and all the Canon cameras in another. That way we get the benefit of the DxO testing without getting into the issue of their treatment of Canon. DxO Mark publishes their results as a graph that shows the scores and the launch date for the camera. You can sort by manufacturer, type, and other criteria. Ultimately, they just publish the information a a graph, and have the individual cameras listed to the left. I don’t find this horribly useful, but here is the link to their page. First, the cameras are grouped by sensor size. As you will see in a second, the size of the digital sensor is a big factor in low-light performance. For each camera model, the top two rows are the camera’s price and number of megapixels. This is just to give you a general sense of the camera, but you will see that the megapixels impact things a bit. After that, you will see score from DxO Mark. As already mentioned, this is displayed as a specific ISO score. For the final row for each camera, you will see the number of stops that the camera deviates from the average of its class (sensor size). This is important. As we’ll see below, this helps put the measurements in proper perspective. Within each section, I separate the cameras by manufacturer to avoid any issues related to Canon (as mentioned above). The reason for the bottom row in the chart for each camera, which is labeled “Stops from Avg,” is to help you interpret the data from DxO Mark. Recall that the data is listed by DxO Mark as specific ISO values. As you probably know, ISO is measured in f-stops. So this line takes the DxO Mark score and converts it into f-stops. The comparison is to the average value for the cameras at each sensor size. The idea is to keep from putting too much emphasis in small changes in the DxO Mark score. For example, you might look at the first two cameras on the chart and see that the Olympus PEN E-PL7 has a low-light performance score of 873, while the OM-D E-M5 has only an 826. That seems pretty significant, right? But once we convert it to f-stops, we see that this difference is miniscule. To show that these changes are often very minor,we will compare (in f-stops) each camera to the average of all the cameras with the same sensor size. The average low-light performance for Micro 4/3 cameras is 824. The OM-D E-M5 comes in at 826, or right about average. The PEN E-PL7 comes in at 873, which is 47 points over the average. Remember that this is ISO and it is measured in f-stops, which is a doubling of light. One full stop above ISO 800 is ISO 1600. You need a score of 1600 for a one-stop difference in the low-light performance of these cameras. You need a score of 1200 for a half-stop difference. You need a score of 1033 for even a 1/3 stop difference. In this case, however, you don’t have any of that. You have only a difference of 47 points, which is less than a 1/16 stop difference. That’s what I’m trying to get across there. To add some additional context, most cameras only allow changes in 1/3 stop increments. Changes of less than 1/3 stop do not even result in one click of a button or dial on your camera. You will see from the chart that most cameras are less than 1/4 of a stop from the average for their sensor size. Therefore, once the differences are converted to f-stops, it is seen that most of these changes are minor to the point of being irrelevant. 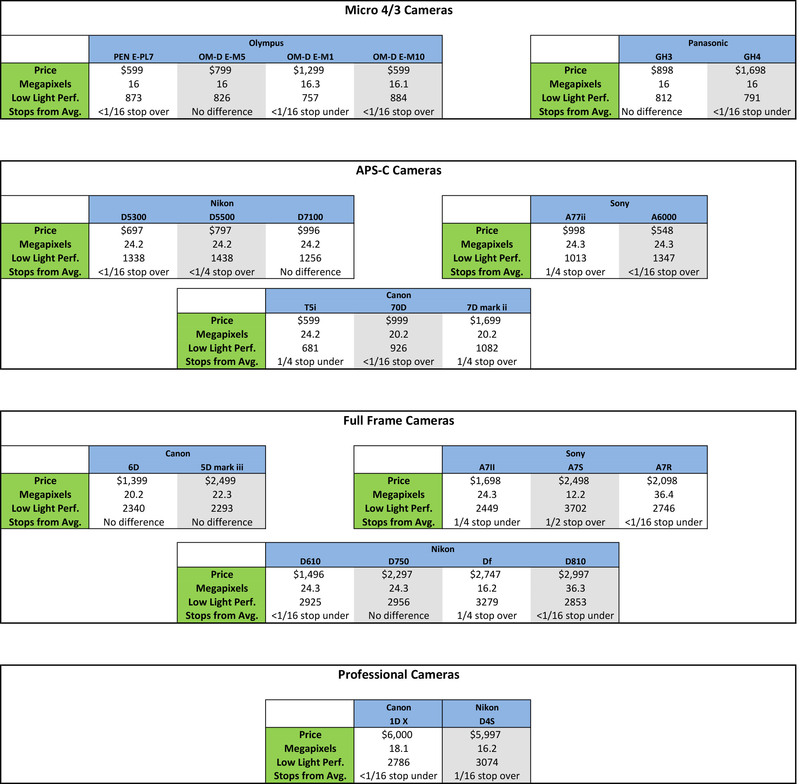 Micro 4/3 cameras scored only an average of 824 in the testing. They were by far the lowest cameras tested. Stepping up to an APS-C sensor results in an average of 1135. That is about a 1/3 stop increase over Micro 4/3 cameras. That is not too dramatic, but it is significant. Full frame cameras averaged 2838, which is over a full stop increase over APS-C sensors. So when it comes to full frame cameras, the size of the sensor definitely matters. One could argue that, since full frame cameras tend to be the flagship cameras of their manufacturers, it is not the sensor size that is causing the higher low-light performance, but rather improvements in other areas. Frankly, I cannot rule that out with what I have here. But given that there are improvements in low-light performance with every increase in sensor size (I do not show compacts here, but take my word for it they are the worst performing cameras) it appears to be due to sensor size. As we will see, cameras do not deviate from others cameras with the same sensor size very much. Once you have chosen a given sensor size, what else matters to low light performance? According to the DxO Mark data, not much. Let’s take a look at the models within each sensor size. Again, I determined the average value for each sensor size. Models of a given sensor size tend to all be the same. Micro 4/3 Cameras: None of the cameras deviated even 1/16 of a stop from the average. APS-C Cameras: None of the Nikons or Sonys deviated more than 1/4 from the average for non-Canon cameras. Canon cameras were all within 1/4 stop of the average for Canon cameras. Full Frame Cameras: There actually was some deviation from the average, but that is largely because we have a low-light specialist in the mix (the Sony A7S). It was a full half-stop over the average for non-Canon full frame cameras. All the other Nikons and Sonys were within 1/4 stop of the average for non-Canon cameras. Canon cameras were all within 1/4 stop of the average for Canon cameras. I created a separate category for professional cameras. I wanted to see if paying $6,000 got you significantly increased low-light performance. Turns out, it doesn’t. These cameras scored slightly higher, but were within the range of the other full frame cameras. The higher the megapixels within a given sensor size, the worse the low light performance. Conversely, the lower the number of megapixels within a given sensor size, the better the low light performance. A few examples show this. Within the full frame category, the best low light performance camera was the Sony A7S, which has only 12.2 megapixels spread out on a full frame sensor. The next best performers were the Nikon Df and the Nikon D4S, which were both at only 16.2 megapixels on full frame sensors. As more megapixels get added by different cameras, low-light performance decreases. It has not a 100% relationship, and the issue with measuring Canon cameras further confuses the issue, but I think you will see the relationship. DxO Mark graph showing scores and launch dates for Entry-Level and Semi-Pro DSLRs. Again, the improvements are sporadic and there is certainly not a 100% correlation between launch date and low-light performance. But I think you’ll notice the overall upward trend. Sensor size is the number one factor in determining low light performance. That was clear at every level. Once you start looking at the DxO Mark scores as f-stops, all differences among cameras within a given sensor size are minor, and usually insignificant. Armed with this information, if you are looking to purchase a camera with great low-light performance, get a new model with the largest sensor size you can afford, but with only a moderate number of megapixels. Of course, low-light performance is only one aspect of choosing a digital camera, but it is an important one – and one that will not be clear from the specifications. So I hope this helps you choose. When I originally prepared this article, there was no Sony A7Rii, A7Sii, Canon 5DS, or Canon 5DS R, among other cameras. I have created a new Guide to Low Light Performance in Digital Cameras to update the information in this article (and provide a few new things as well). If you are already a subscriber to Outdoor Photo Academy, just go to the guides page where the rest of the guides are (if you don’t have the link, I include it at the bottom of every newsletter). If you aren’t already a subscriber of Outdoor Photo Academy, subscribe now for immediate access to the updated Guide to Low Light Performance in Digital Cameras (current as of November 2015). It’s free. You’ll also get my 3 other photography guides (the Photographer’s Resource Guide, the Mirrorless Camera Guide, and The Photographer’s Guide to Creating an Online Portfolio) for free as well. There’s no spammy stuff involved. I’ll send you a series of emails over the first week or two to get you started, and after that I will send you a newsletter every few weeks pointing you to the best parts of Outdoor Photo Academy.